Check your scale's setting: is it set to weigh in kilograms or pounds? Incorrect measurement settings seem to be the root of the argument in most social media debates. Do a test at home: grab anything with a known weight above 2kg, such as your dumbbells or a bag of sugar (put it in a sturdy shopping bag for easy lifting), and see what the reading is. If it is pretty accurate, then you have nothing to worry. Remove the leader line and lead before you transfer your catch to the wet weigh sling – this is an easy oversight and will lead to a false reading. You need to hold your scale correctly to ensure you're not adding additional weight. Analog scales are particularly sensitive and shouldn't be picked up at its base – it can easily add another kilo. Instead, pick it up from the loop at the top or use an easy lift bar to get the most accurate reading. The CarpFever team tested this notion, and the proof is in the pudding, as they say. Have a look at our results further down below. Remember, if you take your reading in pounds, make sure your friends are aware to avoid any confusion. Always check your scale's instruction manual for proper guidance. If you’re using a digital scale, have spare batteries handy, you never know when the current ones might give up on you. For the experiment we gathered lead in a weigh sling until our Reuben Heaton 7000 Series digital scale tipped in at 10kg exactly. We lifted the lead using the correct method: by the loop with an easy lift bar. We lifted the lead quite a few times with these digital scales, and the weight did fluctuate slightly, but only by give or take 50 grams. We then lifted each of these scales by the base (holding it incorrectly), and the weight changed drastically – giving us a surprisingly hard time. We were on the receiving end of higher and lower readings from the same scale, every time we changed our grip. We have found the digital scales to be particularly sensitive at the base, just by lightly touching the stainless steel hook (weigh sling excluded), we added an additional 50 to 200 grams. When we changed our grip, with our hands snuggly around the hook (with the weigh sling included), we actually reduced the weight by 200 grams. The analog scale gave us the biggest headache with a great difference in weight. Firstly, if you look at the digital scales' readings compared to the analog, it seems like the analog scale added an additional 250g. As soon as we lifted it up (incorrectly) at the base, our 'catch' became even heavier, tipping the scale at 10.8kg. Always take care of your equipment and make sure it is in good condition. 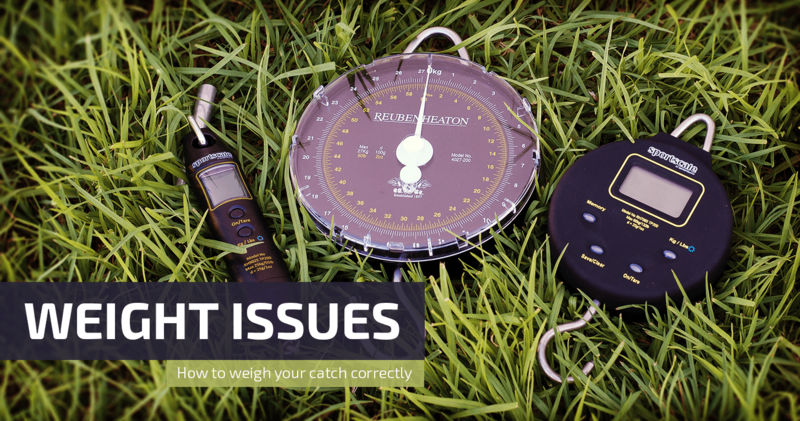 Every catch is worth its weight in gold, so an accurate reading is essential. At the end of the day, a false reading will only be detrimental to yourself and may lead to some unnecessary backlash. If you're not sure, then take the time to weigh your catch again, but remember to zero your scale (wet weigh sling included), and most importantly keep your catch wet and safe. A special thanks to the Tackle Tart team for sharing a few of their products with us to perform these tests. Visit their website at www.tackletart.co.za. Let us know what your findings are with your scale. Leave a comment below or email us at info@carpfever.co.za.